On a remote ranch near the Ozarks, a young girl sits glued to an ancient TV set, as the Belmont, the third leg of the Triple Crown, unfolds. Thrilled beyond belief, she witnesses history in the making as Ann Collins pilots her beautiful black colt, Stormy Lightning, to victory. But Janie Bailey experiences more than a fan’s worship of horse racing. The previous winter, during a severe snowstorm, a black colt mysteriously appeared in their back pasture. When no owner surfaced, for a brief time he was hers. Then a fateful mishap on a trail ride in the mountains sent him fleeing back into the wilderness. When the cameras pan a close-up of Ann’s champion, Janie gasps, for she knows irrevocably that her colt, Storm, and this now famous racehorse are one in the same! The idea seems so preposterous, will anyone believe her? Living so far away, how can she contact Ann to let her know about Lightning’s past? Janie has an even bigger secret. Lightning left a piece of himself behind. Earlier that year, a paint mare belonging to her family gave birth to a black and white colt, an image of his sire. Wouldn’t Ann want to hear about this, too? What will the future hold for Janie and her promising gift horse? 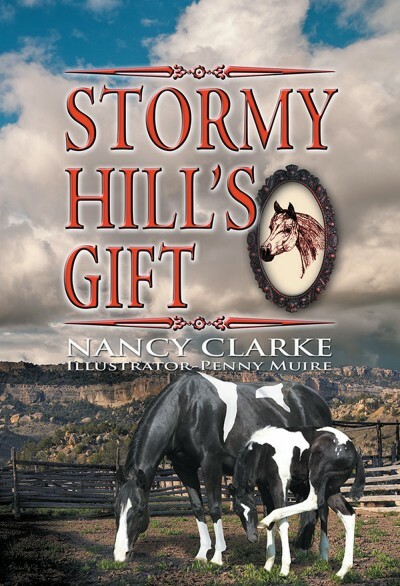 Stormy Hill’s Gift is the fifth book in The Stormy Hill series.